By Neil Chue Hong, Simon Hettrick, Aleksandra Pawlik and Giacomo Peru. The ability to communicate your work is vital, whether you are a researcher, software developer or manager. Lightning talks are a popular way of allowing many people to talk about their work in a short time, and making it easy to work out who you should grab for a conversation at the coffee break. (They're popular at workshops, like our Collaborations Workshop.). For many, the idea of giving a talk under such strict timing can be terrifying. 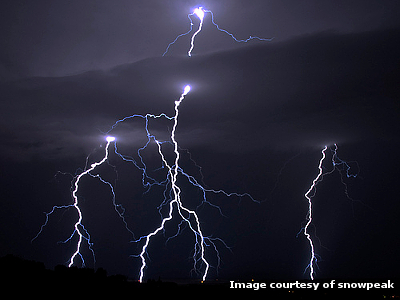 These top tips will help you become an electrifying lightning talk presenter. This applies to all presentations, but is especially important for a lightning talk! If you don’t finish on time, the audience will have missed a part - a potentially fundamental part - of your talk. Rehearse your timings a number of times (you can even do this in front of a mirror or a friendly audience). Learn your style - most people speed up when presenting in front of an audience, but some slow down or elaborate more. Write a script if it helps to time the talk, but don't read from the script when you present for real. It's a good idea to invert your talk: talk about the really important things first, but in scant detail, and then go back and explain the in more depth later. This way, even if your talk is cut off due to a timing error, you'll still have expressed the main points. The mantra for lightning talks is: one message, one message, one message. Your audience will be subjected to one speaker after another in quick succesion, this is not a format designed for expansive descriptions or nuanced arguments. You only have a few minutes to make an impression (potentially less time than that), so focus on the one message and make sure you deliver it clearly. It can seem scary - or flippant even - to focus so tightly on one message, but it's necessary to get your message across. Don’t try and explain the entirety of your work - instead use your limited time to create a memorable impression. It's the job of your webpage (provide the URL) or your email address to provide the further information the audience is looking for. And they can always come and speak to you during a coffee break. The majority of lightning talks limit the number of slides you can use. Even though the time you're given to speak is limited, don't be tempted to cram your slides full of information to compensate. Focus on the one message you want to get across (for the same reasons as described above) and prepare slides that complement, not repeat, what you say. Rely on the age old adage that a picture tells a thousand words, and use one or two memorable images to support your talk. You can also be bold and put a single provocative question or statement on your slide with no other text or images. It's a good idea to put details such as your name and a URL or email address for further information, but make sure this is on screen for long enough to be copied down. Make sure these are visible, but unobtrusive. Lightning talk sessions include many speakers, so your goal is to make your slides memorable. People might not remember your name, but they will remember that "your talk was the one with the I-Spy books in it”. Choose something pretty that also helps to memorise your message and you'll be able to wow your audience as you deliver your talk and get questions in the coffee break afterwards. People get annoyed if you explain the obvious and lost if you skip over the difficult. If you are finding it difficult to explain everything in the limited time, it is a sign that you are trying to cram too much information into the talk. If you lose the audience during a normal presentation, you might be able to win them back later. Lose the audience during a lightning talk, and you lose the entire talk. Understand your audience: what is their motivation for attending the talks, and what do they want to take from them? Lightning talk sessions are generally run to provide the potential for new collaborations, so make it clear what you want and how people can contact you. Spend some time investigating the type of people that will attend the session. This is fairly easy for domain-specific events, and somewhat more difficult for cross-disciplinary ones. If the session has taken place over previous years, look at the talks that took place (or even just their titles) and try and determine what works best for the audience. At risk of labouring the point: you'll lose your audience if you cram too much into your presentation, so remember not to stray from the one message (see point two above). We can't emphasise this enough: your talk has a lot more impact if you can repeat your key message before you get yanked off stage!